Long before Jackie Chan was born, another star startled the world with acrobatic stunts that defied the law of gravity and threatened to break every bone in his body. 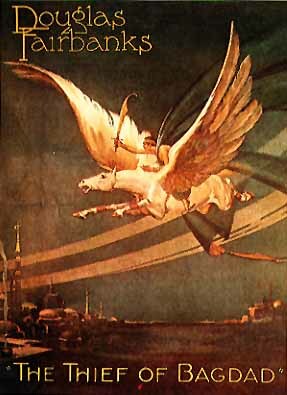 And that star was Douglas Fairbanks. He bounded across the screen, leaping from windows, swinging on tree vines, racing up yardarms, and sliding down curtains and sails. He filled his movies with stunts, sword fights, chases, and sea battles, and throughout his movies, he broadcast the carefree spirit of a swashbuckler, always grinning, always ready for a challenge. In the 80+ years since his arrival in Hollywood, only Errol Flynn ever came close to capturing the same excitement and thrills that Fairbanks provided. Starting with The Mark of Zorro in 1920, Fairbanks became forever identified with adventure roles. As Zorro emblazoned his enemies with the letter Z, Fairbanks emblazoned his zestful image on the minds of moviegoers around the world. He continued his run of successful adventure classics with The Thief of Bagdad, Don Q, Son of Zorro and many others. And now thanks to Kino on Video, we can experience many of his movies again. In a set of 10 videos in their "Douglas Fairbanks: King of Hollywood" series, Kino gives us some previously unavailable gems, such as The Black Pirate and El Gaucho, as well as the familiar Fairbanks classics. In addition, they also give us a look at Douglas Fairbanks before he assumed the acrobatic adventurer role, back when he was a comedian, in the Harold Lloyd mold. Most lovers of silent films are well familiar with Fairbanks' The Mark of Zorro and The Thief of Bagdad; however, many of his other adventurer roles have been difficult to see. Kino on Video addresses this problem by giving us five unreleased Fairbanks classics: The Black Pirate, The Three Musketeers, Robin Hood, El Gaucho, and The Iron Mask. In comparison to The Black Pirate, the other movies don't take such a headstrong lunge from one scene to the next. Robin Hood and The Three Musketeers, in particular, take their time establishing the setting and background before Fairbanks really springs to action. In Robin Hood, for example, the movie takes over an hour to establish Fairbanks as the Earl of Huntington before he becomes Robin Hood. But Robin Hood is an absolute feast for the eyes. Directed by the great Allan Dwan, Robin Hood's sets tower over the actors, with huge castles and moats, spires that reached to the clouds and lush forest glens. (When the movie was filmed in 1922, these sets were the largest ever created for a movie, even outdoing Intolerance.) But both The Three Musketeers and Robin Hood tend to stumble through the big action scenes, with Robin Hood featuring a band of merry men who leap and prance through the forest like a troop of not-a-care-in-the-world elves. But both of these films feature some wonderful bits of comedy that evoke memories of Buster Keaton and Harold Lloyd, such as when Fairbanks as the Earl of Huntington in Robin Hood first appears on screen. He proudly steps forward in a suit of armor and pulls off his helmet, only to catch his mustache in the face mask. He winces and rubs his lip. Fairbanks strikes a considerably different image in El Gaucho. Filmed in 1928, near the end of his reign as a matinee idol (as his hairline receded and his gut expanded), El Gaucho finds him assuming a character with more depth than most of his previous roles. Fairbanks plays the outlaw leader of a pack of bandits who become the unlikely heroes of a small Latin American town, high up in the Andes, when an unscrupulous military leader takes control of the town's famous religious shine. Particularly impressive is the interplay between Fairbanks and the earthy and vivacious Lupe Velez. As lovers, they slap and claw, alternately loving and hating one another. Of all his roles, El Gaucho features his best acting. If you're only looking for Fairbanks' certified masterpieces, Kino on Video has also re-released The Mark of Zorro, The Thief of Baghdad, Don Q, Son of Zorro in crisp, new prints. For the uninitiated, these three movies are a great introduction to Fairbanks, featuring him at his acrobatic best. The Mark of Zorro was his first foray into adventure roles after several years in comedies. Compared to his following adventure movies, The Mark of Zorro is smaller in scale. But it profits by allowing Fairbanks to take a larger role. He isn't overpowered by the scenery this time. As a result, his bounds through windows and across rooftops carry greater force. The Thief of Bagdad is one of the true marvels of the silent cinema, a visually opulent extravaganza of Arabian Nights intrigue. William Cameron Menzies' sets evoke a mix of Middle-Eastern and Oriental splendor, with strong touches of expressionism, while Fairbanks bounded from giant urns, rode a magic carpet, and fought a dragon. For Don Q, Son of Zorro, Fairbanks ventured to Old Spain, with bull whip in one hand and a sword in the other, for a thrilling tale of Zorro's son wrongly accused of murder and assuming the identify of a masked avenger to clear his name. At the movie's conclusion, Zorro appears (thanks to some split screen photography) to help his son fight the corrupt royal armies. Fairbanks' foray into the adventure genre is all the more surprising when one considers his career before The Mark of Zorro. Kino's "Douglas Fairbanks: King of Hollywood" series gives us four comedies from Fairbanks early years on two double-feature tapes. The Nut (1921) even evokes images of Buster Keaton as Fairbanks plays an inventor who loves gadgets and fills his home with a series of machines to get him out of bed, washed, and dressed. 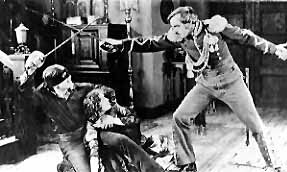 Filmed at the same time as The Mark of Zorro--as insurance if the public didn't accept him in adventurer roles--The Nut reveals Fairbanks as one of the silent screen's best comedians. Fairbanks plays The Mollycoddle (1920) for comedy also, but it allowed him to test his chops in an adventurer role. At the beginning of the movie, his character is a foppish, soft-as-a-pillow dandy. He wears a monocle because of how it looks, not because he needs it. 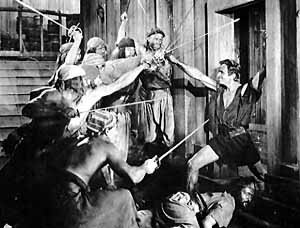 But when pressed into action, the blood of his forefathers emerges and he rides to the rescue of his friends, even at one point battling Wallace Beery in a huge brawl that sends them spilling down the side of a mountain, through an adobe house, into a river and over a waterfall. As entertaining as these movies are, they're mostly languishing on video store shelves. At every video store I've been in lately, I've asked about the "Fairbanks: King of Hollywood" series and in every case the clerks shrug and say the tapes have only rented a handful of times. And that's a shame. Douglas Fairbanks was one of the greatest action heroes the world has ever seen. His boundless enthusiasm for life fills every frame of his movies and his movies deserve to be known and passed on from one generation to the next. The next time you're at the video store and you're thinking of renting the new Jean-Claude Van Damme or Steven Seagal video, think again and reach for Douglas Fairbanks instead. You won't be disappointed. The videos in the "Douglas Fairbanks: King of Hollywood" series are available from Kino on Video for $24.95 each. The Black Pirate is also available as a laser disc for $49.99. The laser disc includes a reprint of the original souvenir program and running commentary on a separate audio track by Rudy Behlmer.